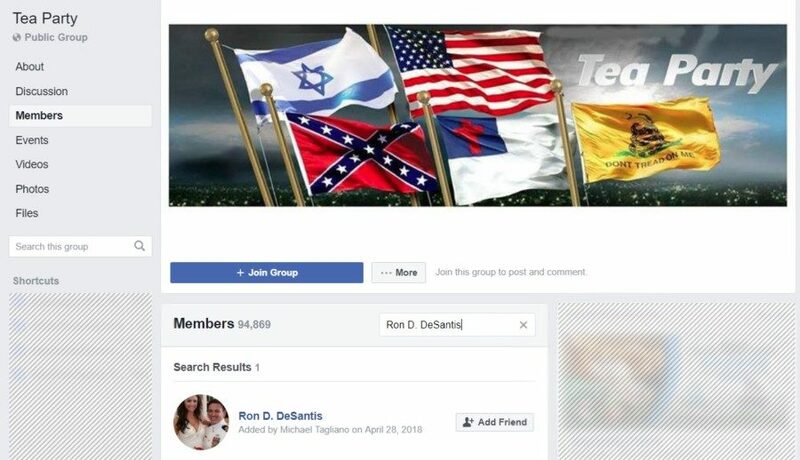 Florida gubernatorial candidate Ron DeSantis claimed that he was added to Facebook group known for sharing bigoted content and conspiracy theories without his knowledge or consent. A spokesperson for U.S. Representative Ron DeSantis confirmed that the Republican nominee in Florida’s gubernatorial race had been a member of a Facebook group that frequently shares racist, Islamophobic, and other bigoted content, but insisted that DeSantis had been unaware of his involvement with the group. “The real story here is that the Democrats are desperate to talk about anything other than real issues that matter to Floridians. They’re doing anything and everything to try to distract from the failed, corrupt, socialist record of their candidate, Andrew Gillum, but Floridians won’t buy it come November,” Lawson stated. In addition to their pro-DeSantis messages, this “Tea Party” Facebook group has a penchant for sharing bigoted content and spreading conspiracy theories. They’ve previously posted derogatory comments about former first lady Michelle Obama, called Black Lives Matter activists “vermin,” claimed John McCain supported the Muslim Brotherhood, and suggested that the white nationalist rally in Charlottesville was a media hoax. Facebook groups allow anyone with a Facebook account who is a member of the group to arbitrarily add any other Facebook user to a group without asking first as long as that user is on his or her friends list. Whether your addition to a group by someone on your friends list was meant to benefit you or was done maliciously, you aren’t given the opportunity to opt-in. You are in. Once users have been added as member of a group, they can just as easily be made administrators of that group without taking any action on their part. 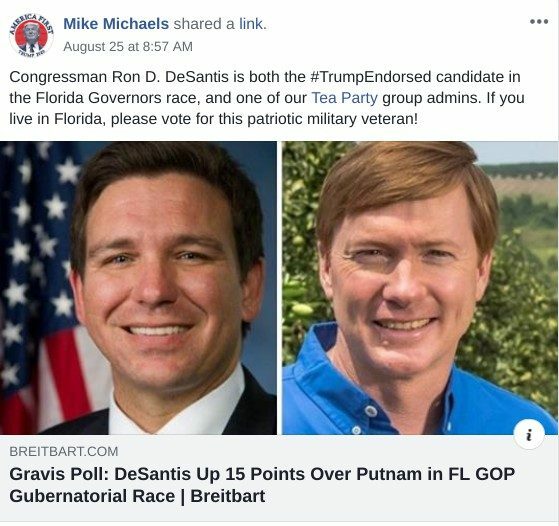 Although DeSantis left the Facebook group and asserted that he was never an active participant in it, other Republican politicians, such as U.S. Senate candidate Kelli Ward of Arizona, have embraced it. Ward has promoted the Tea Party group on her Facebook page and has also shared content directly to the Tea Party group page. Media Matters reported that a variety of Republicans running for office, including Daniel Crenshaw, Tanny Tarkanian, Corey Stewart, Matt Rosendale, and Patick Morrisey, were also previously listed as members of this group. All five of those politicians have also since left the Facebook group. Media Matters. 30 August 2018. Media Matters. 6 July 2018. Tampa Bay Times. 31 August 2018.